The America the Beautiful coin series from the United States Mint is already massively popular among collectors, which makes these Colorized ATB Coins from Emporium Hamburg that much more valuable to those who appreciate colorized precious metals. 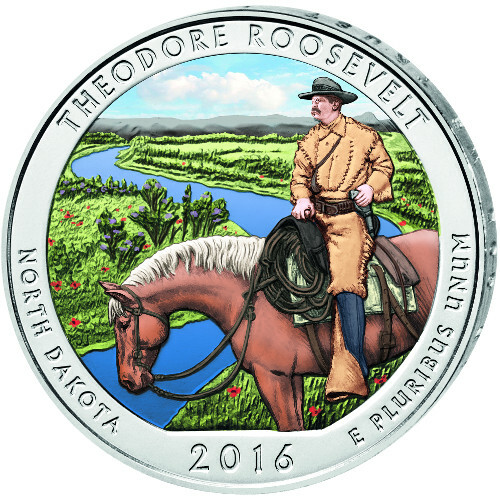 The 2016 5 oz Colorized Silver ATB Theodore Roosevelt National Park Coin is available today on Silver.com. Ships to you in a leather-effect display with acrylic case. Mintage limited to 500 colorized coins only! Fourth coin in 2016 and 34th overall in the ATB Series. Reverse features a colorized depiction of the Theodore Roosevelt National Park. Obverse includes a left-profile portrait of George Washington. Each of the 2016 5 oz Colorized Silver ATB Theodore Roosevelt National Park coins in this product listing has the addition of beautiful colors to the design on the coin’s reverse face. You’ll see President Theodore Roosevelt captured in real-life colors, with the backdrop alive in hues of green, white, and blue dotting the natural landscape. 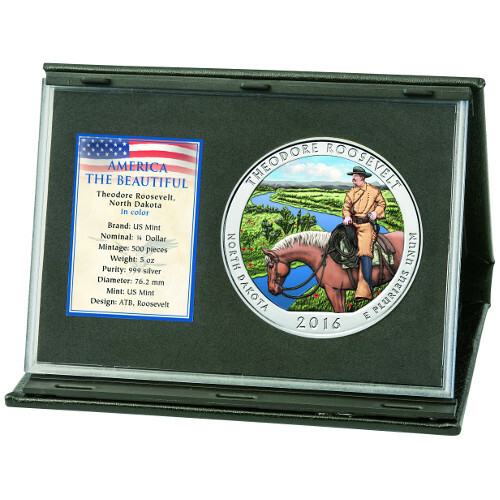 The reverse of the ATB Theodore Roosevelt National Park coin depicts Roosevelt atop his horse as he surveys the lands of North Dakota around the Missouri River basin. Roosevelt was an avid outdoorsman and hunter, traveling the United States and the world hunting big game. It was his presidency that set in motion the explosive growth of land conservation through the national parks and forest systems. 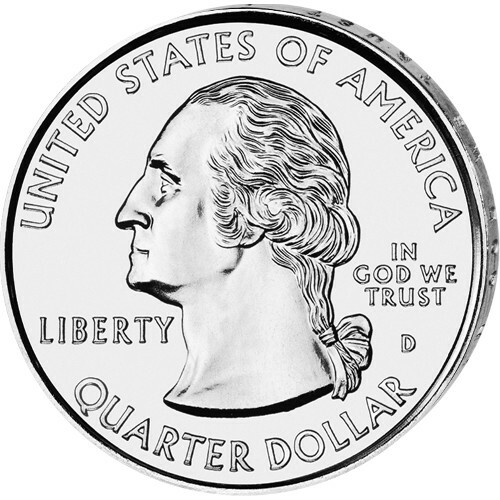 On the obverse is the familiar left-profile portrait of the nation’s first elected president, George Washington. President Washington’s image has appeared on circulation quarters since 1932, when it was refined by John Flanagan based upon a 1786 bust by William Cousins. There is no colorization added to this side. To protect your purchase, Emporium Hamburg ships these coins to encapsulated in an acrylic case. That case is set within a beautiful leather-effect display for the perfect addition to any individual collection. The United States Mint is the mint of origin for these coins, but does not colorize its products. Emporium Hamburg procured these coins from the US Mint and colorized them for avid collectors to purchase. We encourage all Silver.com shoppers to reach out to us with questions regarding the coin in this listing. You can contact us on the phone at 888-989-7223, or connect with our customer service team online. We’re available through our live chat and email services.